Playapod Version 1.3: Show Favorites, Custom Settings and More! Playapod Version 1.3 is packed with awesome new features including show favorites, custom show settings, and new popup action menus. We’ve also made improvements to the Precision Progress Bar and created additional playback rates. This version was designed to enhance the user experience by simplifying access to your favorites, allowing for easy customization, and making playback effortless. Check out the full list of features and screenshots of the best podcast app below. Favorite Shows – Group your favorite shows together at the top of the “My Podcasts” screen for quicker access. Drill down into the new “Favorite Shows” group to see only those episodes you care most about. 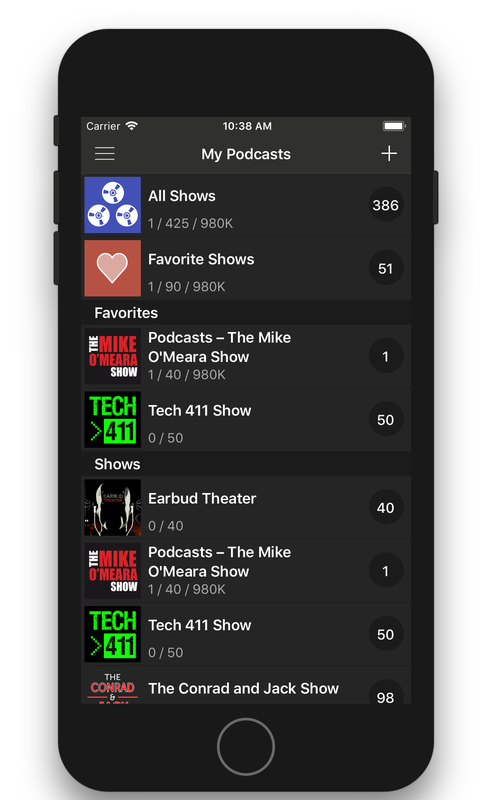 Show favorites is synced across all devices. Custom Show Settings – Utilize this feature to override playback and download settings on a per show basis. All shows will use the global app settings unless custom show settings are configured. 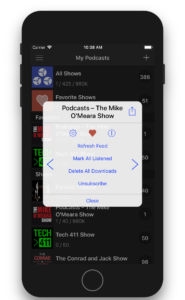 Show Action Menu – The new Show popup menu allows users to share shows, change show settings, toggle show favorites, view show info, refresh show feed, mark all episodes as listened, delete downloads, and unsubscribe. Dialog popup appears after long pressing on any show on the My Podcasts screen and includes navigation buttons to quickly navigate through the show list and apply custom actions. 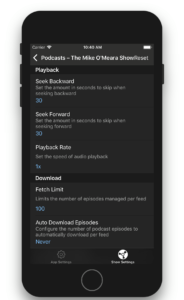 Episode Action Menu – The new Episode popup menu allows users to share episodes, change show settings, toggle episode favorites, view episode info, mark episodes as new or listened, clear episode progress, delete downloads, and add/remove episode from playlist. Dialog popup appears after long pressing on any episode includes navigation buttons to quickly navigate through the episode list and apply custom actions. Playback Rate – For extra customization, we added additional playback rates of 1.0x, 1.1x, 1.2x, 1.3x, 1.4x, 1.5x, 1.75x, and 2.0x. 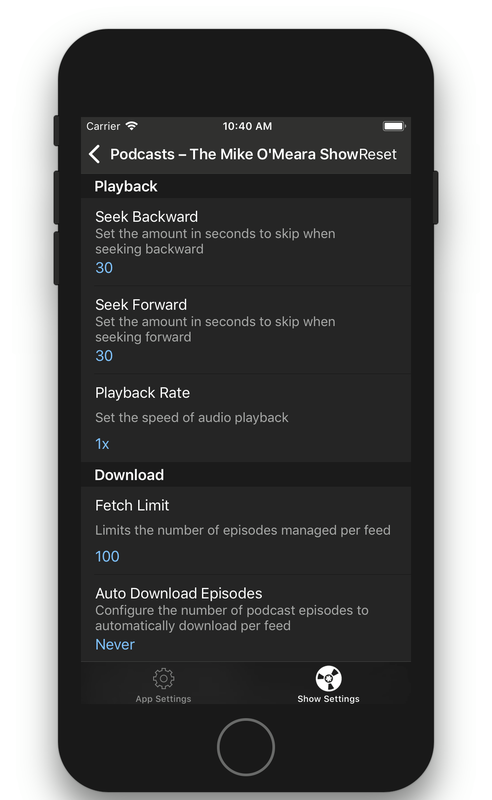 Playback Rate can now be set for individual podcasts within the show settings. Playback Rate will default to the value specified in app settings if not specified in the show settings. The Playback Rate button on the Now Playing screen adjusts current playback speed, but does not alter existing App or Show settings. Progress Bar – Scrubbing the progress bar will now snap the media position to the end of each listened area which makes it easier than ever to continue where you left off. Bookmarks are given priority as snap points on the progress bar. Settings Screen – Reset button added to the toolbar to allow reverting back to default app settings or clearing custom show settings. Settings Screen includes a tab bar that allows switching between App or Show Settings. Other Minors Updates – We added the Share App button to the My Podcasts toolbar. The Bookmark button was changed from a heart icon to a bookmark icon to reduce confusion between the favorite buttons. Fixed displaying incorrect information when navigating episodes and media was stopped. Fixed issue with resetting of current position when toggling playback while streaming. Upgrade Playapod to the latest version in order to take advantage of these new features. After you have had the opportunity to try the new features please consider updating your app store review. If you have any suggestions for improvements please e-mail us using the Send Feedback button or connect with us on Facebook or Twitter. Thanks for helping us make Playapod the best podcast app in the world! This entry was posted in Podcasting and tagged Android, iOS, mobile, mobile app, playapod, pod, podcast, podcaster, podcasting, upgrade, version. Bookmark the permalink.